"Fewer index keys were found than records in: GLBAT_CT (3036578, 3036462, Tag: ACCOUNT) A Database Maintenance should be performed"
I have performed the regular "Automatic Repairs" from the Windows "Capital Office" and have also tried to repair from the "Database Maintenance" section of the Windows "Installation Workshop". Both of these complete successfully, but do not resolve the issue. 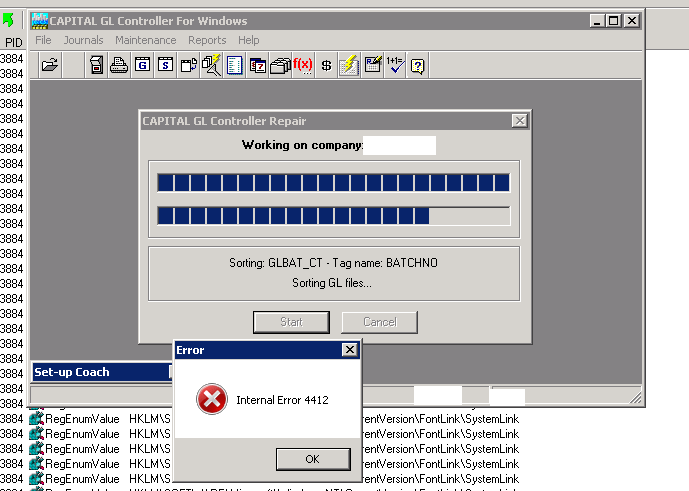 After this error comes up, the GL Controller application crashes with a General Protection Fault. 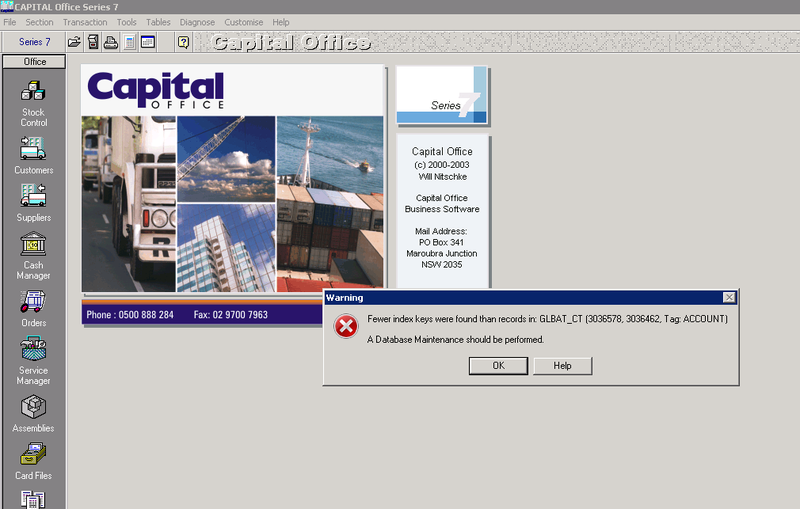 Launching Capital Office after this gives the same index keys warning (i.e. the fault remains). Can you please suggest what we should do to repair the database? Unfortunately that is 16-bit software that developed was phased out on over a decade ago. We no longer run that software anywhere. An automatic repair should, however, rebuild all index files including GL files. So there should not be any need to run the GL repair process separately. If you still get a warning about fewer index keys, that might just be a false alarm message. (Maybe.) If you still actively use the software and never updated it, it might also be the case that your database has grown in size to a point where the operating system will no longer correctly handle the large file size(s). Subject to your license, if you're entitled to a later V8 version, you could try running a repair operation on that. However, we no longer distribute very old versions of the V8 Series either, and later releases of V8 will no longer run alongside Series 7.